[Mike] dropped us a tip to show off a system he has built to control some power sockets based on his proximity. 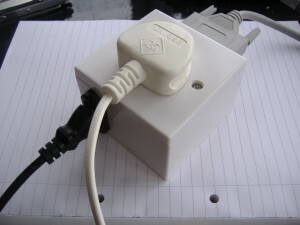 Initially the project started as a parallel port controlled box to switch the mains power. Then he got the idea of turning this into a little more interactive of an automation tool. He is utilizing the bluetooth from his cell phone as a locator. When the box senses that he’s in the room, the power is on. When he leaves the area, the power is off. You can see his ruby code on his web site if you wanted to give it a try or offer improvements. Cool Project! I do something similar to this, but using Insteon for the control. My system knows I’m home based on the presence of my bluetooth interface and also from motion sensors in the ADT alarm system, which feeds data to my automation system via an AD2USB interface. Triggering scenes based on occupancy is then easy. This is a great way of toggling mains, I use x10 systems at work, the possibilities for using this in assistive technology to aid vulnerable people has plenty if potential. you what? I suggest upgrading to something reliable. The X10 is reliable enough, the people getting out of bed at night and not having the means or the memory to turn the lights on is the unreliable part. I’m trying to build a power socket that detects if your laptop needs charging or not. At my work we waste a lot of energy because ppl are charging their laptop the whole day (even when the battery is full). so interference and stray signals might give a false positive? it musnt be THAT hard cuz you can buy a mini cell antenna that blinks when your in a call or sendtxt or web… when attached instead of anntenna.